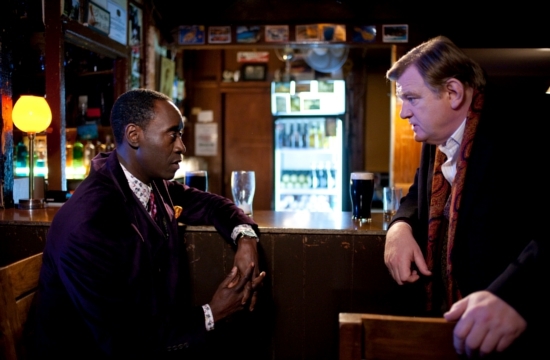 Don Cheadle and Brendan Gleeson make for an odd "odd couple" in John Michael McDonagh's The Guard. In the picturesque, green and blustery, west coast Irish hamlet of Connemara, an oddball but endearing local cop (Brendan Gleeson) ends up working a case with a no-nonsense FBI agent (Don Cheadle) after his new partner disappears and some international drug smugglers come to town in The Guard. It’s the “fish-out-of-water” buddy-cop stuff we’ve seen time and time again, but writer-director John Michael McDonagh attempts to put a new spin on it, just as his brother, Martin McDonagh (who serves as one of the producers here) put a new spin on the hit-man-in-crisis dark comedy a few years earlier in the far superior In Bruges. I really wanted to like The Guard, but spare for Gleeson’s solid performance, it feels tired, tonally off and forced. Though it’s missing a beautiful score from Carter Burwell and the all important midgets, this McDonagh brother copies his more talented brother’s style to a tee. There are philosophical drug smugglers, trysts with hookers, kooky locals, nice shots of local scenery, gallows humor, f-bombs galore and real violence. I like my humor dark and dry…but it’s too low-key to work in The Guard, and the cartoonish action bits lack suspense. The lesser McDonagh also tries to add in slices of real human drama (that worked so organically well for his brother in In Bruges) but the side-plots involving Gleeson’s dying mother and his missing partner’s wife fall flat. While there is some moderately good dialogue strewn about (clearly both brothers know how to craft profanely un-PC one-liners) and an attempt at character development, there is no character depth. Gleeson makes the most of his meaty role, but Cheadle is wasted. We never get any substantial back-story or motive for why these two men became officers of the law, and there’s no detectable drive or subtext behind their desire to stop the smugglers other than they have nothing better to do. The attempts to add color to the criminals doesn’t work, either, as again, they spout funny bits and ironic philosophical quotes not because of any keen insight into their true nature, but because they are in a movie and it seemed like it would be clever for them to do so. When I first saw the trailer for The Guard, something about it seemed off. Later I learned it was made by Martin McDonagh’s brother, and I remember I had felt similarly about the original trailers for In Bruges, and of course, I ended up loving that movie. I took a shot on The Guard hoping to be surprised and proved wrong, but my gut instinct was right. It’s a huge disappointment. It smacks of both nepotism (more famous brother helping less famous brother break into filmmaking) and of a lesser talent riding the coattails of a greater talent hoping to find success using a watered-down version of the same formula that had previously worked so well. Don’t get me wrong, both brothers who started out as playwrights, have a gift for writing darkly humorous dialogue. It’s just clear now that Martin knows better than John Michael how to use that gift in the service of superior filmmaking. It makes me wonder…if the Coen Brothers made films separately and not together…would one stumble in the shadow of the other? Maybe these Irish lads should stick together like glue if they want to have a similarly fruitful career in film. This entry was posted in Art-house Cinema, Movie Reviews, Movies and tagged Brendan Gleeson, Buddy Cops, Connemara, Dark Comedy, Don Cheadle, Drug Smuggling, Fish out of Water, Ireland, John Michael McDonagh, Martin McDonagh, The Guard. Dude Im starting to really doubt you here, you liked In Bruges? It was like a promofilm for Bruges that Bruges bought… and nothing else really.